subterfuge and procrastination are altogether strange bedfellows, but both have their uses. though most cyclists would be loathe to admit it for fear of having their pain and suffering undermined, coffee is the principal objective of every bike ride. yes, cycling weekly fills its pages with endless methods of improving stamina, fitness, speed, climbing and flexibility, but those are all simply variables pertaining to the quest for a double espresso or soya cappuccino. it's our secret, and it's likely to stay that way because believe me, nobody outside of our cosy little circle reads any of this stuff anyway. in this singular pursuit of happiness, it would be deemed unseemly to simply head out the door and ride straight to debbie's and back. though i'm confident that i bear an uncanny resemblance to a cyclist at speed on the way down the strand, you just never know who you'll meet when supping coffee. that could denounce a hard-won reputation in an instant, something that does not complement the tough-guy persona that my mirror provides on a daily basis (of course there's nothing wrong with it). so, on a cold, fresh saturday morning, upon removing the colnago from its bikeshed resting place, and in order to assume an appropriate level of subterfuge, i took off in entirely the wrong direction for debbie's. it works every time. this took me into a headwind towards islay international airport, but tellingly, i sneaked up the link road to the high road which, i readily admit, now pointed me in an appropriate direction for coffee. that, however, would be all too easy; this is just where subterfuge was joined by procrastination. at the point of diversion, i was a mere 15km from a fine cup of coffee (or two), yet headed north towards ballygrant. the temptation of a body swerve at the cluanach crossroads was almost too easily avoided, and a most enjoyable climb to storakaig was partaken by rider and colnago alike. at this point, figuring anyone checking up on me would have either given up, or lost interest around knocklearach, i turned south, hell-bent on making it to debbie's by lunchtime. for not only were my thoughts now absorbed by froth, they had slid sideways and were now incorporating cheese and chutney sandwiches and a square of tablet. but why, you might well ask, am i telling you all this? 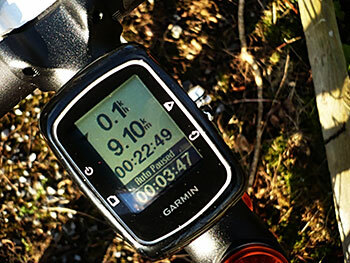 would i not be less intrusive and more practical in simply pointing you in the direction of my garmin connect web page, where you could see for yourself where i'd been, how long it took me to get there, and at what an embarrassingly low average speed forward motion had proceeded? well of course i would, but where's the subterfuge and procrastination in that? the lines drawn on the map were placed there courtesy of a garmin 200 gps unit specifically designed for the act of cycling. in comparison with its siblings, the 200 is compact and bijou with a nice, clear display and a couple of buttons on each side. i don't mind admitting that the latter feature was unexpected. with the recent addition of the 800 gps, garmin entered the world of the iphone by enabling a colour touchscreen that apparently works with even a gloved finger. surely progress that would subsume subsequent releases. so there i was on the sitting room floor, having plugged in the accompany mains charger to ready the device for use, pressing the screen in answer to the questions i was being asked to complete setup. boy was i disappointed. 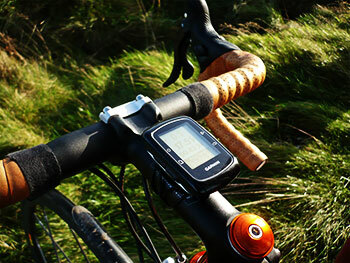 if apple can place a touchscreen on their ipod nano, and still sell at a reasonable price, why not garmin? at this point, they are guilty of a little fib; not one that will rain bolts of lightning down upon them, but a fib nonetheless. if i might quote from the appropriate page on garmin's website "thereÕs no setup required - just pop it onto the included bike mount and youÕre ready to roll.". close but not quite; you do have to opt for twelve or 24 hour time settings, whether you fancy metric or imperial measurements, and your body weight. not much to set up, but not quite the same as none at all. as i have mentioned to the point of boredom, i don't do numbers. if i'm disarmingly honest, the feature i use most on cycle computers is the time of day. when in ready and waiting mode, the 200 displays the time of day in the top left corner; very impressive since there is no gps signal on my sitting room floor, and it never asked me to set the time at any point. however, once the ride option has been selected, and the poor blighter tries desperately to acquire a satellite signal, the clock display disappears, making no reappearance until the ride has been completed, saved and we're back where we started. that makes it darned inconvenient to find out the time of day mid-ride, for so far as i can ascertain, the ride recording would have to be stopped to see the time. i have come across murmurings regarding garmin's customer service when reviewing previous units, but rarely had cause to verify. in this case, i can do little but corroborate; i attempted to contact technical support to enquire if there was any way of having a clock display while riding, and was informed that a reply could be expected within three days. i'm still waiting. in practice, the no setup required is all but fulfilled. click the on-screen labelled buttons to start the ride, and up comes the display providing details of speed, distance and elapsed time. the fourth figure at the bottom of the display can be switched from average speed, to calorific output to ascent. it's possible to alter the settings and enable auto pause, something i failed to do first time out, returning home with an abysmal average speed. not a mistake you make twice if you intend uploading details of each ride to garmin connect. 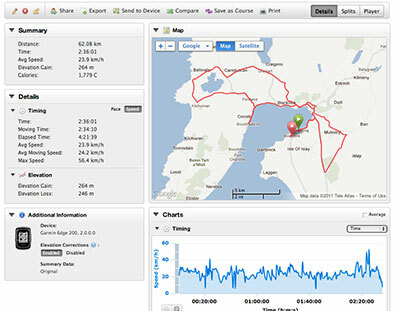 this latter feature is garmin's free web-based software. it's a simple matter to setup a free account online before plugging the 200 into your computer's usb port. the software does the rest, finding the unit, checking the stored history and uploading. 'tis then a simple matter of looking at a map (either google or microsoft) showing where you've been, accompanied by all sorts of data and graphs that, quite frankly, didn't mean that much to me. but then, i have no desperate need of training minutiae. unlike other garmin devices, the 200 does not contain or display any map information, but at the price, that's really not too suprising. it is, however, possible to scroll through all the stored rides, choose that which interests you most and a rudimentary diagram pertaining to the ride in question is displayed front and centre. 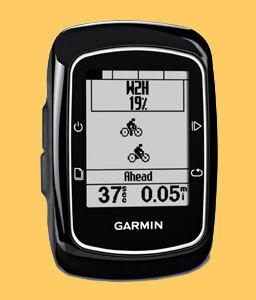 yet again according to garmin's website, the unit contains a feature entitled challenge me; - A digital cyclist shows your speed relative to your past performance, along with an indication of how far ahead or behind you are. 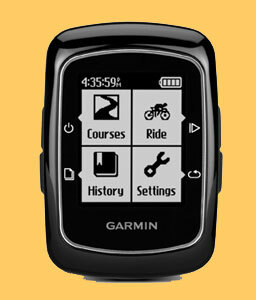 You also can download rides from other Garmin Connect users for a virtual competition. though i count myself as reasonably computer literate, i could find no way to enable this feature, and nothing in the manual that would help. the utterly brilliant bit, however, is the total lack of bits and bobs needed to make the 200 work. no need to affix a magnet to the spokes, run wires up the front brake cable, or stick a speed sensor to the front fork leg, then faff about trying to have it recognise the magnet. nor is there any need to scientifically calculate tyre diameter. all this is taken care of by the satellite. in the box there are two bike mount brackets and some mini-bungee cords, allowing fitting on stem or handlebar, and bearing in mind the foregoing, you can swap between bikes without so much as the thought of re-calibration. it's a doddle to fit and remove from the bracket and was totally secure throughout the review period. the screen is easily readable, though occasionally reflections got the better of legibility. however, there is a backlight to ease reading in difficult or darkened conditions, one that switches itself off after a few seconds. pressing appropriate buttons in full-finger gloves was sometimes a bit hit or miss, and i'd love it if garmin saw fit to offer a version with touchscreen facility. even more so, if they'd just give me a clock that could remain on display permanently. it's not too much to ask is it? other than that, it's good; really very good.